Following the outbreak of World War II on 1 September 1939, the Kingdom of Romania under King Carol II officially adopted a position of neutrality. However, the rapidly changing situation in Europe during 1940, as well as domestic political upheaval, undermined this stance. Fascist political forces such as the Iron Guard rose in popularity and power, urging an alliance with Nazi Germany and its allies. As the military fortunes of Romania's two main guarantors of territorial integrity — France and Britain — crumbled in the Fall of France, the government of Romania turned to Germany in hopes of a similar guarantee, unaware that the then dominant European power had already granted its consent to Soviet territorial claims in a secret protocol of 1939's Molotov-Ribbentrop Pact. In summer 1940, a series of territorial disputes were diplomatically resolved unfavorably to Romania, resulting in the loss of most of the territory gained in the wake of World War I. This caused the popularity of Romania's government to plummet, further reinforcing the fascist and military factions, who eventually staged a coup that turned the country into a fascist dictatorship under Mareșal Ion Antonescu. The new regime firmly set the country on a course towards the Axis camp, officially joining the Axis powers on 23 November 1940. As a member of the Axis, Romania joined the invasion of the Soviet Union on 22 June 1941, providing equipment and oil to Nazi Germany as well as committing more troops to the Eastern Front than all the other allies of Germany combined. Romanian forces played a large role during the fighting in Ukraine, Bessarabia, Stalingrad, and elsewhere. Romanian troops were responsible for the persecution and massacre of up to 260,000 Jews on Romanian-controlled territories, though most Jews living within Romania survived the harsh conditions. After the tide of war turned against the Axis, Romania was bombed by the Allies from 1943 onwards and invaded by advancing Soviet armies in 1944. With popular support for Romania's participation in the war faltering and German-Romanian fronts collapsing under Soviet onslaught, King Michael of Romania led a coup d'état, which deposed the Antonescu regime and put Romania on the side of the Allies for the remainder of the war. Despite this late association with the winning side, Greater Romania was largely dismantled, losing territory to Bulgaria and the Soviet Union, but regaining Northern Transylvania from Hungary. Approximately 370,000 Romanian soldiers died during the war, most of them in Soviet captivity. Ethnic map of Greater Romania according to the 1930 census. 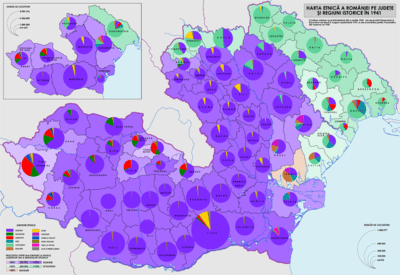 Sizeable ethnic minorities put Romania at odds with Hungary, Bulgaria and the Soviet Union throughout the interwar period. In the aftermath of World War I, Romania, which fought with the Entente against the Central Powers, had greatly expanded its territory, incorporating the regions of Transylvania, Bessarabia and Bukovina, largely as a result of the vacuum created by the collapse of the Austro-Hungarian and Russian empires. This led to the achievement of the long-standing nationalist goal of creating a Greater Romania, a national state that would incorporate all ethnic Romanians. However, the newly gained territories also included significant Hungarian, German, Bulgarian, Ukrainian and Russian minorities, which put Romania at odds with several of her neighbors. This occasionally led to violent conflict, as exemplified by the Hungarian-Romanian War and the Tatarbunary uprising. To contain Hungarian irredentism, Romania, Yugoslavia and Czechoslovakia established the Little Entente in 1921. That same year, Romania and Poland concluded a defensive alliance against the emergent Soviet Union, and in 1934 the Balkan Entente was formed with Yugoslavia, Greece and Turkey, who were suspicious of Bulgaria. Since the late 19th century, Romania had been a relatively democratic constitutional monarchy with a pro-Western outlook, but the country faced increasing turmoil in the 1930s as a result of the Great Depression and the rise of fascist and other far-right movements such as the Iron Guard, which advocated revolutionary terrorism against the state. Under the pretext of stabilizing the country, the increasingly autocratic King Carol II proclaimed a "royal dictatorship" in 1938. The new regime featured corporatist policies that often resembled those of Fascist Italy and Nazi Germany. In parallel with these internal developments, economic pressures and a weak Franco-British response to Hitler's aggressive foreign policy caused Romania to start drifting away from the Western Allies and closer to the Axis. On 13 April 1939, France and the United Kingdom had pledged to guarantee the independence of the Kingdom of Romania. Negotiations with the Soviet Union concerning a similar guarantee collapsed when Romania refused to allow the Red Army to cross its frontiers. On 23 August 1939 Germany and the Soviet Union signed the Molotov-Ribbentrop Pact. Among other things, this pact recognized the Soviet "interest" in Bessarabia (which had been ruled by the Russian Empire from 1812–1918). This Soviet interest was combined with a clear indication that there was an explicit lack of any German interest in the area. Eight days later, Nazi Germany invaded the Second Polish Republic. Expecting military aid from Britain and France, Poland chose not to execute its alliance with Romania in order to be able to use the Romanian Bridgehead. Romania officially remained neutral and, under pressure from the Soviet Union and Germany, interned the fleeing Polish government after its members had crossed the Polish-Romanian border on 17 September, forcing them to relegate their authority to what became the Polish government-in-exile. After the assassination of Prime Minister Armand Călinescu on 21 September King Carol II tried to maintain neutrality for several months longer, but the surrender of the Third French Republic and the retreat of British forces from continental Europe rendered the assurances that both countries had made to Romania meaningless. Romania after the territorial losses of 1940. The recovery of Bessarabia, roughly corresponding to the Moldavian Soviet Socialist Republic, was the catalyst for Romania's entry into the war on Germany's side. In 1940, Romania's territorial gains made following World War I were largely undone. In July, after a Soviet ultimatum, Romania agreed to give up Bessarabia and Northern Bukovina. Two thirds of Bessarabia were combined with a small part of the Soviet Union to form the Moldavian Soviet Socialist Republic. The rest (Northern Bukovina, northern half of the Hotin county and Budjak) was apportioned to the Ukrainian Soviet Socialist Republic. 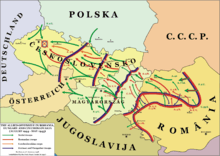 Shortly thereafter, on 30 August, under the Second Vienna Award, Germany and Italy mediated a compromise between Romania and the Kingdom of Hungary: Hungary received a region referred to as "Northern Transylvania", while "Southern Transylvania" remained part of Romania. Hungary had lost Transylvania after World War I in the Treaty of Trianon. On 7 September, under the Treaty of Craiova, Southern Dobruja (which Bulgaria had lost after the Romanian invasion during the Second Balkan War in 1913), was ceded to Bulgaria under pressure from Germany. Despite the relatively recent acquisition of these territories, they were inhabited by a majority of Romanian speaking people (except Southern Dobruja), so the Romanians had seen them as historically belonging to Romania, and the fact that so much land was lost without a fight shattered the underpinnings of King Carol's power. On 4 July Ion Gigurtu formed the first Romanian government to include an Iron Guardist minister, Horia Sima. Sima was a particularly virulent anti-Semite who had become the nominal leader of the movement after the death of Corneliu Codreanu. He was one of the few prominent far-right leaders to survive the bloody infighting and government suppression of the preceding years. Antonescu and Adolf Hitler at the Führerbau in Munich (June 1941). In the immediate wake of the loss of Northern Transylvania, on 4 September the Iron Guard (led by Horia Sima) and General (later Marshal) Ion Antonescu united to form a "National Legionary State" government, which forced the abdication of Carol II in favor of his 19-year-old son Michael. Carol and his mistress Magda Lupescu went into exile, and Romania, despite the unfavorable outcome of recent territorial disputes, leaned strongly toward the Axis. As part of the deal, the Iron Guard became the sole legal party in Romania. Antonescu became the Iron Guard's honorary leader, while Sima became deputy premier. In power, the Iron Guard stiffened the already harsh anti-Semitic legislation, enacted legislation directed against minority businessmen, tempered at times by the willingness of officials to take bribes, and wreaked vengeance upon its enemies. On 8 October German troops began crossing into Romania. They soon numbered over 500,000. 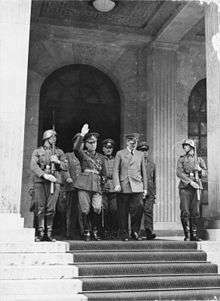 On 23 November Romania joined the Axis powers. On 27 November, 64 former dignitaries or officials were executed by the Iron Guard in Jilava prison while awaiting trial (see Jilava Massacre). Later that day, historian and former prime minister Nicolae Iorga and economist Virgil Madgearu, a former government minister, were assassinated. The cohabitation between the Iron Guard and Antonescu was never an easy one. On 20 January 1941, the Iron Guard attempted a coup, combined with a pogrom against the Jews of Bucharest. Within four days, Antonescu had successfully suppressed the coup. The Iron Guard was forced out of the government. Sima and many other legionnaires took refuge in Germany; others were imprisoned. Antonescu abolished the National Legionary State, in its stead declaring Romania a "National and Social State." Romania annexed Transnistria, the area between the Dnieper and Southern Bug, in July 1941 (1941 ethnic map). 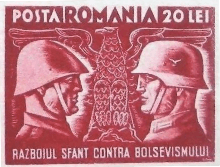 1941 stamp depicting a Romanian and a German soldier in reference to the two countries' common participation in Operation Barbarossa. The text below reads "the holy war against Bolshevism". On 22 June 1941 Germany launched Operation Barbarossa, attacking the Soviet Union on a wide front. Romania joined in the offensive, with Romanian troops crossing the River Prut. After recovering Bessarabia and Bukovina (Operation München), Romanian units fought side by side with the Germans onward to Odessa, Sevastopol, Stalingrad and the Caucasus. The Romanian contribution of troops was enormous. The total number of troops involved on the Eastern Front with the Romanian Third Army and the Romanian Fourth Army was second only to that of Nazi Germany itself. The Romanian Army had a total of 686,258 men under arms in the summer of 1941 and a total of 1,224,691 men in the summer of 1944. The number of Romanian troops sent to fight in The Soviet Union exceeded that of all of Germany's other allies combined. A Country Study by the U.S. Federal Research Division of the Library of Congress attributes this to a "morbid competition with Hungary to curry Hitler's favor... [in hope of]... regaining northern Transylvania." Bessarabia and the Northern Bukovina were now fully re-incorporated into the Romanian state after they had been occupied by the USSR a year earlier. As a substitute for Northern Transylvania, which had been given to Hungary following the Second Vienna Award, Hitler persuaded Antonescu in August 1941 to also take control of the Transnistria territory between the Dniester and the Southern Bug, which would also include Odessa after its eventual fall in October 1941. Although the Romanian administration set up a civil government, the Transnistria Governorate, the Romanian state had not yet formally incorporated Transnistria into its administrative framework by the time it was retaken by Soviet troops in early 1944. Romanian armies advanced far into the Soviet Union during 1941 and 1942 before being involved in the disaster at the Battle of Stalingrad in the winter of 1942–43. Petre Dumitrescu, one of Romania's most important generals, was commander of the Third Army at Stalingrad. In November 1942, the German Sixth Army was briefly put at Dumitrescu's disposal during a German attempt to relieve the Third Army following the devastating Soviet Operation Uranus. Prior to the Soviet counteroffensive at Stalingrad, the Antonescu government considered a war with Hungary over Transylvania an inevitability after the expected victory over the Soviet Union. Although it was the most dedicated ally of Germany, Romania's turning to the Allied side in August 1944 was rewarded by returning Northern Transylvania, which had been granted to Hungary in 1940 after the Second Vienna Award. 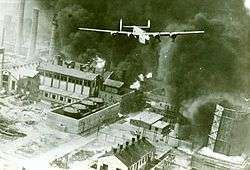 American B-24 Liberator flying over a burning oil refinery at Ploiești, as part of Operation Tidal Wave on 1 August 1943. Due to its role as a major supplier of oil to the Axis, Romania was a prime target of Allied strategic bombing in 1943 and 1944. Throughout the Antonescu years, Romania supplied Nazi Germany and the Axis armies with oil, grain, and industrial products. Also, numerous train stations in the country, such as Gara de Nord in Bucharest, served as transit points for troops departing for the Eastern Front. Consequently, by 1943 Romania became a target of Allied aerial bombardment. One of the most notable air bombardments was Operation Tidal Wave — the attack on the oil fields of Ploiești on 1 August 1943. Bucharest was subjected to intense Allied bombardment on 4 and 15 April 1944, and the Luftwaffe itself bombed the city on 24 and 25 August after the country switched sides. In February 1943, with the decisive Soviet counteroffensive at Stalingrad, it was growing clear that the tide of the war was turning against the Axis powers. By 1944, the Romanian economy was in tatters because of the expenses of the war, and destructive Allied air bombing throughout Romania, including the capital, Bucharest. In addition, most of the products sent to Germany were provided without monetary compensation. As a result of these "uncompensated exports", inflation in Romania skyrocketed, causing widespread discontent among the Romanian population, even among groups and individuals who had once enthusiastically supported the Germans and the war. Beginning in December 1943, the Soviet Dnieper–Carpathian Offensive pushed Axis forces all the way back to the Dniester by April 1944. In April–May 1944, the Romanian forces led by General Mihai Racovițǎ, together with elements of the German Eighth Army were responsible for defending northern Romania and took part in the Battles of Târgu Frumos, which David Glantz considered to be an initial Soviet attempt to invade Romania, supposedly held back by Axis defensive lines in northern Romania. The Jassy–Kishinev Offensive, launched on 20 August 1944, resulted in a quick and decisive Soviet breakthrough, collapsing the German-Romanian front in the region. Soviet forces captured Târgu Frumos and Iași on 21 August and Chișinău on 24 August 1944. 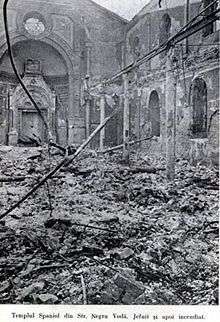 Sephardic Temple in Bucharest after it was robbed and set on fire in 1941. See also Responsibility for the Holocaust (Romania), Antonescu and the Holocaust, Porajmos#Persecution in other Axis countries. According to an international commission report released by the Romanian government in 2004, between 280,000 and 380,000 Jews in the territories of Bessarabia, Bukovina and Transnistria were systematically murdered by Antonescu's regime. Of the 25,000 Romani deported, who were deported to concentration camps in Transnistria, 11,000 died. Though much of the killing was committed in the war zone by Romanian troops, there were also substantial persecutions behind the front line. During the Iaşi pogrom of June 1941, over 12,000 Jews were massacred or killed slowly in trains traveling back and forth across the countryside. Half of the 320,000 Jews living in Bessarabia, Bukovina, and Dorohoi district in Romania were murdered within months of the entry of the country into the war during 1941. Even after the initial killings, Jews in Moldavia, Bukovina and Bessarabia were subject to frequent pogroms, and were concentrated into ghettos from which they were sent to Nazi concentration camps, including camps built and run by Romanians. The number of deaths in this area is not certain, but the lowest respectable estimates run to about 250,000 Jews and 25,000 Romani in these eastern regions, while 120,000 of Transylvania's 150,000 Jews died at the hands of the Germans later in the war. Romanian soldiers also worked with the Einsatzkommandos, German killing squads, tasked with massacring Jews and Roma in conquered territories. Romanian troops were in large part responsible for the Odessa massacre, in which over 100,000 Jews were shot during the autumn of 1941. Nonetheless, most Jews living within the pre-Barbarossa borders survived the war, although they were subject to a wide range of harsh conditions, including forced labor, financial penalties, and discriminatory laws. Jewish property was nationalized. Of all the allies of Nazi Germany, Romania bears responsibility for the deaths of more Jews than any country other than Germany itself. The murders committed in Iasi, Odessa, Bogdanovka, Domanovka, and Peciora, for example, were among the most hideous murders committed against Jews anywhere during the Holocaust. Romania committed genocide against the Jews. The survival of Jews in some parts of the country does not alter this reality. 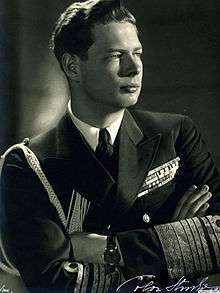 King Michael I of Romania led the coup that put Romania on the Allied side. This resulted in a split of the country between those that still supported Germany and its armies and those that supported the new government, the latter often forming partisan groups and gradually gaining the most support. To the Germans the situation was very precarious as Romanian units had been integrated in the Axis defensive lines: not knowing which units were still loyal to the Axis cause and which ones joined the Soviets or discontinued fighting altogether, defensive lines could suddenly collapse. In a radio broadcast to the Romanian nation and army on the night of 23 August King Michael issued a cease-fire, proclaimed Romania's loyalty to the Allies, announced the acceptance of an armistice (to be signed on September 12) offered by Great Britain, the United States, and the USSR, and declared war on Germany. The coup accelerated the Red Army's advance into Romania, but did not avert a rapid Soviet occupation and capture of about 130,000 Romanian soldiers, who were transported to the Soviet Union, where many perished in prison camps. The armistice was signed three weeks later on 12 September 1944, on terms virtually dictated by the Soviet Union. Under the terms of the armistice, Romania announced its unconditional surrender to the USSR and was placed under occupation of the Allied forces with the Soviet Union as their representative, in control of media, communication, post, and civil administration behind the front. It has been suggested that the coup may have shortened World War II by up to six months, thus saving hundreds of thousands of lives. Some attribute the postponement of a formal Allied recognition of the de facto change of orientation until 12 September (the date the armistice was signed in Moscow) to the complexities of the negotiations between the USSR and UK. During the Moscow Conference in October 1944 Winston Churchill, Prime Minister of the United Kingdom, proposed an agreement to Soviet leader Joseph Stalin on how to split up Eastern Europe into spheres of influence after the war. 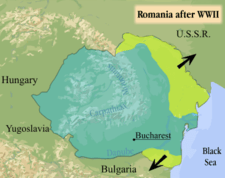 The Soviet Union was offered a 90% share of influence in Romania. The Armistice Agreement of 12 September stipulated in Article 18 that "An Allied Control Commission will be established which will undertake until the conclusion of peace the regulation of and control over the execution of the present terms under the general direction and orders of the Allied (Soviet) High Command, acting on behalf of the Allied Powers. The Annex to Article 18 made clear that "The Romanian Government and their organs shall fulfil all instructions of the Allied Control Commission arising out of the Armistice Agreement." The Agreement also stipulated that the Allied Control Commission would have its seat in Bucharest. In line with Article 14 of the Armistice Agreement, two Romanian People's Tribunals were set up to try suspected war criminals. As the country declared war on Germany on the night of 23 August 1944, border clashes between Hungarian and Romanian troops erupted almost immediately. On 24 August German troops attempted to seize Bucharest and suppress Michael's coup, but were repelled by the city's defenses, which received some support from the United States Air Force. Other Wehrmacht units in the country suffered severe losses: remnants of the Sixth Army retreating west of the Prut River were cut off and destroyed by the Red Army, which was now advancing at an even greater speed, while Romanian units attacked German garrisons at the Ploiești oilfields, forcing them to retreat to Hungary. The Romanian Army captured over 50,000 German prisoners around this time, who were later surrendered to the Soviets. In early September, Soviet and Romanian forces entered Transylvania and captured the towns of Brașov and Sibiu while advancing toward the Mureș River. Their main objective was Cluj (Cluj-Napoca), a city regarded as the historical capital of Transylvania. However, the Second Hungarian Army was present in the region, and together with the Eighth German Army engaged the Allied forces on 5 September in what was to become the Battle of Turda, which lasted until 8 October and resulted in heavy casualties for both sides. Also around this time, the Hungarian Army carried out its last independent offensive action of the war, penetrating Arad County in western Romania. Despite initial success, a number of ad-hoc Romanian cadet battalions managed to stop the Hungarian advance at the Battle of Păuliș, and soon a combined Romanian-Soviet counterattack overwhelmed the Hungarians, who gave ground and evacuated Arad itself on 21 September. The Romanian Army ended the war fighting against the Wehrmacht alongside the Red Army in Transylvania, Hungary, Yugoslavia, Austria and Czechoslovakia, from August 1944 until the end of the war in Europe. 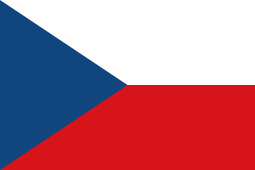 In May 1945, the First and Fourth armies took part in the Prague Offensive. The Romanian Army incurred heavy casualties fighting Nazi Germany. Of some 538,000 Romanian soldiers who fought against the Axis in 1944–45, some 167,000 were killed, wounded or went missing. LEGEND: KIA = Killed in Action; MIA = Missing in Action; WIA = Wounded in Action; POW = Prisoners of war. Map of Romania after World War II indicating lost territories. Under the 1947 Treaty of Paris, the Allies did not acknowledge Romania as a co-belligerent nation but instead applied the term "ally of Hitlerite Germany" to all recipients of the treaty's stipulations. Like Finland, Romania had to pay $300 million to the Soviet Union as war reparations. However, the treaty specifically recognized that Romania switched sides on 24 August 1944, and therefore "acted in the interests of all the United Nations". As a reward, Northern Transylvania was, once again, recognized as an integral part of Romania, but the border with the USSR was fixed at its state on January 1941, restoring the pre-Barbarossa status quo. 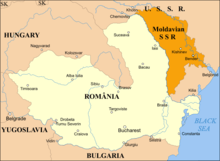 Following the dissolution of the Soviet Union in 1991, the Eastern territories became part of Ukraine and the Republic of Moldova. In Romania proper, Soviet occupation following World War II facilitated the rise of the Communist Party as the main political force, leading ultimately to the forced abdication of the King and the establishment of a single-party people's republic in 1947. Romanian armor during the War comprised a mix of various imported or captured designs that were refurbished as well as several Romanian-produced vehicles. 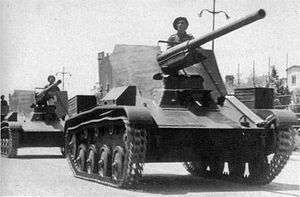 A Romanian A TACAM T-60 during the National Day parade, 10 May 1943. The Romanian Navy consisted mainly of 4 Destroyers, 8 submarines, 12 torpedo boats, and 6 minelayers. Romania itself built 1 minelayer, 2 submarines, 4 minesweepers, and 6 torpedo boats and also re-assembled 6 German Type IIB submarines for use by the Kriegsmarine in the Black Sea, after they were diss-assembled and sent to Romania along the Danube. Romanian facilities also provided maintenance and repair to German and Italian submarines in the Black Sea. Cristian Craciunoiu; Mark W. A. Axworthy; Cornel Scafes (1995). Third Axis Fourth Ally: Romanian Armed Forces in the European War, 1941-1945. London: Arms & Armour. p. 368. ISBN 1-85409-267-7. David M. Glantz (2007). Red Storm over the Balkans: The Failed Soviet Invasion of Romania, Spring 1944 (Modern War Studies). Lawrence: University Press of Kansas. p. 448. ISBN 0-7006-1465-6. Some passages in this article have been taken from the (public domain) U.S. Federal Research Division of the Library of Congress Country Study on Romania, sponsored by the U.S. Department of the Army, researched shortly before the 1989 fall of Romania's Communist regime and published shortly after. , accessed July 19, 2005. 1 2 3 4 U.S. government Country study: Romania, c. 1990. ↑ Henig, Ruth (2013). The Origins of the Second World War 1933-1941. Routledge. pp. 92–93. ISBN 9781134319879. ↑ Axworthy, Mark; Scafes, Cornel; Craciunoiu, Cristian (editors) (1995). Third axis, Fourth Ally: Romanian Armed Forces In the European War 1941-1945. London: Arms & Armour Press. pp. 1–368. ISBN 963-389-606-1. 1 2 International Commission on the Holocaust in Romania (November 11, 2004). "Executive Summary: Historical Findings and Recommendations" (PDF). Final Report of the International Commission on the Holocaust in Romania. Yad Vashem (The Holocaust Martyrs' and Heroes' Remembrance Authority). Retrieved 2012-05-17. ↑ "Belgrade, 1944: The Soviet Offensive | Serbianna Analysis". serbianna.com. Retrieved 2016-02-19. ↑ Armata Română în al Doilea Război Mondial/Romanian Army in World War II, Editura Meridiane, București, 1995, ISBN 973-33-0329-1. Wikimedia Commons has media related to Romania in World War II. Final Report of the International Commission on the Holocaust in Romania (pdf). Bucharest, Romania: International Commission on the Holocaust in Romania. November 2004. p. 89. Retrieved 2012-05-17.